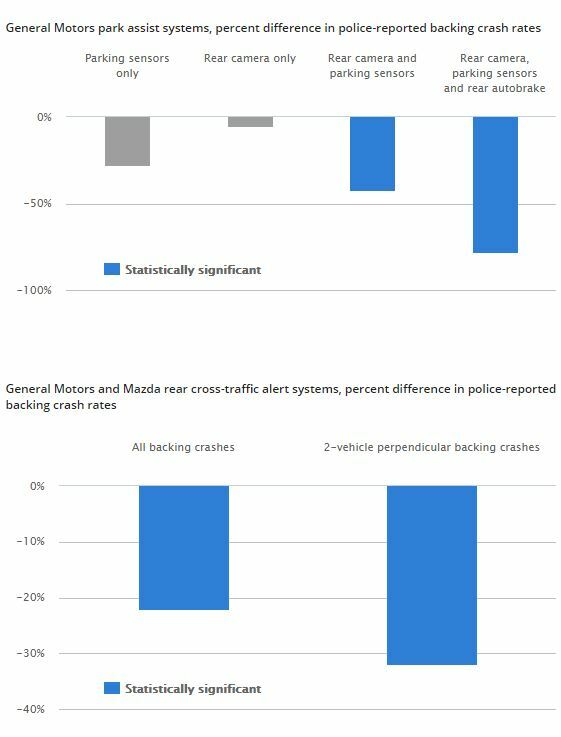 Rear autobraking systems appear to be successful in cutting both crashes reported to police and claims reported to insurers, the Insurance Institute for Highway Safety wrote last month. The technology works well enough that the IIHS will begin issuing ratings on the technology for consumers and insurers. These scores for now are not part of the criteria needed to achieve Top Safety Pick or Top Safety Pick+ status; they’re an ancillary rating for the market to consider. The IIHS has found that a General Motors rearview camera combined with a backup camera (required on all vehicles built starting May 1) and parking sensors eliminated crashes reported to authorities by 78 percent. Rear autobraking itself cut 62 percent of GM crashes reported to police, the IIHS announced Feb. 22. “If all passenger vehicles had a rearview camera, parking sensors and rear autobrake systems that perform like the ones on these GM models, we could eliminate 3 in 4 backing crashes reported to police,” IIHS research Vice President Jessica Cicchino said in a statement. Cicchino’s new research looked at 640 police-reported crashes in 23 states involving 2013-15 model year Cadillac ATS, CTS, Escalade, SRX and XTS models; 2014-15 Buick Lacrosses and Regals; and 2014-15 Chevrolet Impalas. Only the Cadillacs had rear autobraking available. About 71 percent of crashes saw the test vehicles backing into a moving vehicle, while 21 percent of the study group crashed into parked vehicles. Vehicles with both a rearview camera and parking sensors saw 42 percent fewer crashes, while rear autobraking cut collisions another 62 percent. Having all three meant 78 percent fewer backing crashes. Another study looking at rear cross-traffic alert included the GM test subjects from the first research project; 2015 Chevrolet Suburbans and Tahoes; 2015 GMC Yukons; and 2014-16 Mazda CX-3s, CX-5s, CX-9s, MX5 Miata convertibles; Mazda3s; and Mazda6s. The IIHS reported in August 2017 that rear autobraking following alerts made a difference even in vehicles with a backup camera and other rear safety technology, an embarrassing little revelation about Americans’ driving ability. The Highway Loss Data Institute controlled for the presence of front autobraking, forward collision warning, the rearview camera, blind spot monitoring, rear cross traffic alerts, front and rear parking alerts, lane-depearture warning or lane keeping (all were present when the vehicle had rear autobraking) when it studied 2013-15 Cadillac ATS, CTS, Escalade, SRX and XTS models with and without the technology package. 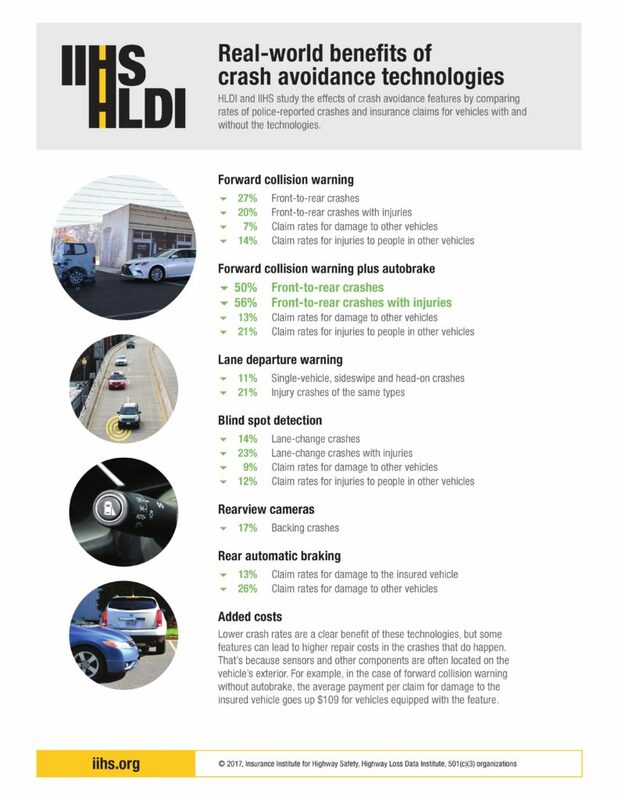 Property damage liability claims fell 26 percent and collision claims fell 13 percent if the Cadillacs had rear autobraking, the HLDI found in August 2017. 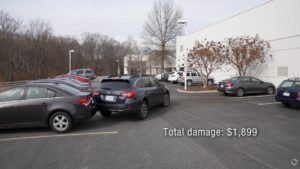 The IIHS also found in August 2017 that a parking camera-park assist combination alone cut backing-into-stuff property liability claims 17 percent and collision claims 7 percent. That study examined the Cadillacs mentioned above and threw in the 2014-15 Buick Lacrosse and Regal, the 2014-15 Chevrolet Impala, and the 2015 Chevrolet Suburban and Tahoe and GMC Yukon. The new tests award a car “superior” if the rear autobrake means the vehicle either “substantially” cuts down the vehicle’s velocity from the 4 mph test speed or doesn’t crash at all in “many ” of the test runs. An OEM gets an “advanced” if it has rear autobraking that stops the car or cuts the speed to less than 1 mph sometimes. A car merely earns “basic” if it has parking sensors or a cross-traffic alert. Rear autobraking can eat into collision repairers’ bread and butter mild-impact repairs. Backing a 2017 Cadillac XT5 into a pole produced what the IIHS estimated was $3,477 repair bill, with the bumper cover, bumper beam, quarter panel, tailgate, hitch bar, trim and some brackets damaged. With rear autobraking, the crash didn’t occur at all. The IIHS also backed a 2017 Subaru Outback into a 2016 Chevrolet Cruze’s rear bumper, resulting in what was estimated at $1,159 in damage to the Outback and $740 to the Cruze. Again, with rear autobraking, the Outback stopped itself from striking the Chevy. Both the XT5 and Cruze earned “superior” ratings. The 2017 BMW 5-Series sedan, Infiniti QX60, Jeep Cherokee and Toyota Prius’ systems made the “advanced” mark. Barely anyone has rear autobraking, which means repairers will have some before the technology starts cutting into their business. The Highway Loss Data Institute estimates it’s standard on 1 percent and optional on 5 percent of the 2018 model year. However, rear cross-traffic alerts are standard on 11 percent of vehicles and optional on 43 percent, and rear parking sensors come standard on a third of the model year and are optional on nearly two-thirds (59 percent). Rearview cameras are now 89 percent standard for the 2018 model year and optional on 10 percent; presumably this will change to 100 percent standard in two months unless that other 10 percent has finished its MY 2018 production run.